With Al Cecere’s retirement in May 2018, the leadership torch was passed to Jim Marietta, a member of the Board of Directors at AEF since its inception in 1985. Jim has hit the ground running in pursuing goals that will bring the organization to new heights, focusing on conservation, education, and facility improvements. Five new Board Members, all bringing their unique experiences and fields of expertise to the AEF, have joined in lending their support. In the spring of 1989, Challenger was hatched in a Louisiana nest. After being blown from his nest in a storm, he was rescued by some well-meaning people who proceeded to hand-feed and raise him—accidentally imprinting him. 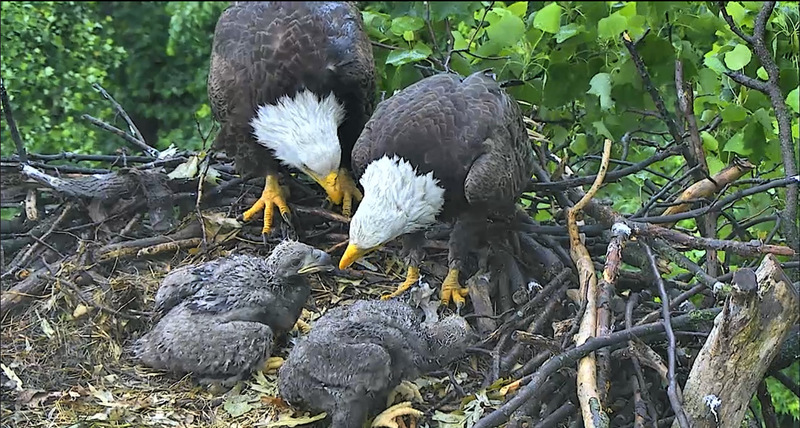 Who would have thought that a tiny baby eaglet would grow up to one day impact millions of people across the world!? After 25 years of traveling coast-to-coast and in conclusion to one of Challenger’s most successful travel seasons in 2017, the American Eagle Foundation would like to express our appreciation to the followers and fans of our famous Bald Eagle for their many years of support. Challenger has reached and educated hundreds of thousands of people nationwide, and has been instrumental in raising awareness about his species. One of Challenger’s last free flights was on January 21, 2018 at Philadelphia’s Lincoln Financial Field where he flew magnificently over a field-sized United States flag. At the end of the flight, Challenger was held aloft by handler Laura Sterbens while the crowd roared in approval. In celebrating Challenger’s 30th birthday this year, the AEF’s dedicated staff is committed to provide the most beneficial and healthy future for this eagle ambassador. Challenger will retire from free-flighted appearances in 2019 but will continue to travel from coast-to-coast making gloved appearances at national sporting events, conventions, conferences, galas, fundraisers, schools, and other events. He will also enjoy well-deserved rest & relaxation and continued daily flight exercise at his Tennessee home. Please stay tuned to our social media outlets for updated videos and posts showing his upcoming travels and daily activities at the AEF in 2019! Our streaming partner, PIKSEL, continued to provide 24/7 HD video for our viewers. In December 2018, AEF formed a new streaming partnership with HDOnTap. They are now providing all our streaming services, as well as support, free of charge! Remarkably (and with a smile of pride from us), Science Trends magazine rated our four cam locations among the 5 Best Eagle Feeds From Florida To Washington! 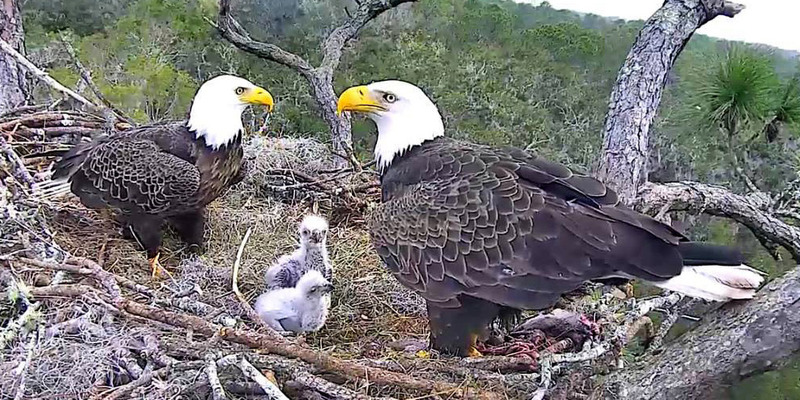 Our cams bring incredible moments to our viewing audiences from our four nest locations. 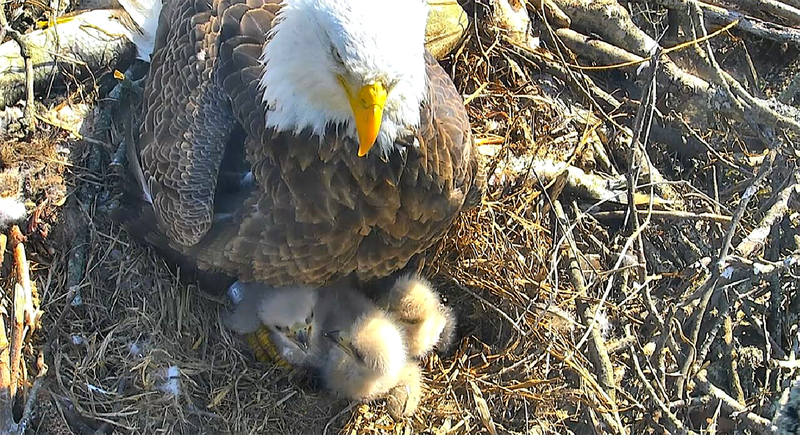 Links below will take you to each cam page as well as a 2018 season recap for each nest. There are links within these pages that will take you to video playlists as well as photos from each nest. 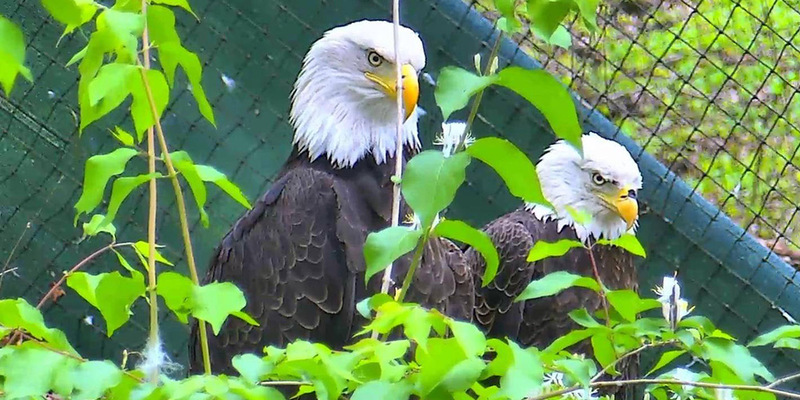 Millions of visitors have been mesmerized by the daily lives of these living symbols of America via our HD video cams. Glenda & Grant were a featured pair in Dollywood’s 2018 season. Romeo & Juliet with their 2018 eaglets, Sky & Spirit. Lady Independence cares for her three babies— Luna, Phoenix, & Nova. On Thursday, June 14, a group of ‘Chatters’ from all over the United States gathered at AEF’s off-site facility for the first day of camaraderie, education, and fun. The ever-popular AEF Chatter Dinner & Auction was held at The Lodge at Hidden Mountain Resort. Energy-charged and enthusiastic guests competed with each other for prized items up for auction and raffle. A visit to the AEF’s hack tower was on the agenda, as well as participation in the Little Pigeon River Cleanup – in partnership with Keep Sevier Beautiful! Lady Independence & Sir Hatcher II rely on the Little Pigeon River as a major food source. 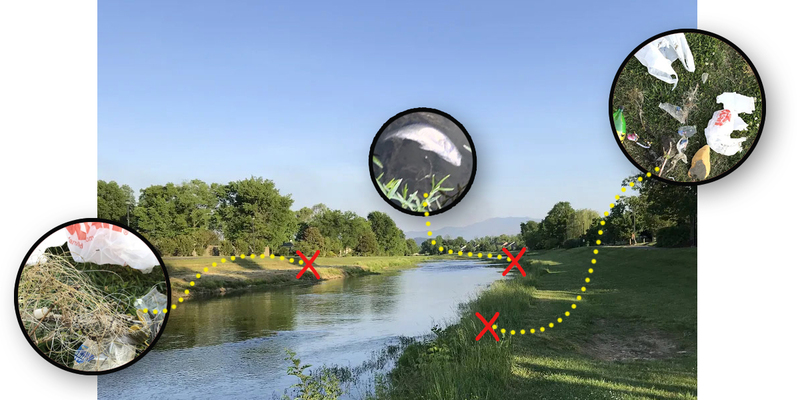 Keeping the river free from discarded hooks, lines, & sinkers will lessen the chances of bringing these harmful items into the nest along with the fish! American Eagle Day was celebrated at Dollywood with a special performance by James Rogers, a meet-and-greet with Challenger, and a visit by John Stokes & Osceola. Of course, everyone enjoyed the fabulous Wings of America Birds of Prey! A total of 48 out of 50 state governors issued Proclamations for American Eagle Day to be observed on June 20! AEF Grants Awarded For 2018 – The American Eagle Foundation is proud to announce its sixth consecutive year supporting eagle conservation and research projects through its Eagle Grants program. Seven chosen applicants received American Eagle Foundation grants—providing $91,814 in funding for work to be carried out in 2018. To date, the American Eagle Foundation has sponsored grants in support of eagle conservation and research totaling almost $600,000. We appreciate the important work of these grantees and are honored to be able to contribute to the continued growth and success of the Bald Eagle population. Jody with AEF Grant poster created for this event. In addition, AEF Grants Coordinator Jodi Millar attended the International Raptor Research Conference held on November 12-16, 2018 at the Kruger National Park in South Africa. During this trip, the American Eagle Foundation committed to fund two projects working to conserve world eagles. The projects are a population assessment of the Steppe Eagle of Kazakhstan, and a population study of the Golden Eagle in Ethiopia. These international grants were given in addition to the many projects we are funding to conserve and protect Bald Eagles. The AEF’s Summer Internship Program focuses on education, training, husbandry, and enrichment. From these categories we try to tailor our internship program for each individual depending on their interests. Every intern is required to complete two individualized projects that pertain to their special area of interest during the course of the summer. Andrea McCravy, a 3rd year student from Auburn University, came to the AEF with previous raptor experience from Southeastern Raptor Center. Her time at AEF was centered around her desire to cultivate a deeper knowledge in raptor education—developing her presentation and speaking ability. 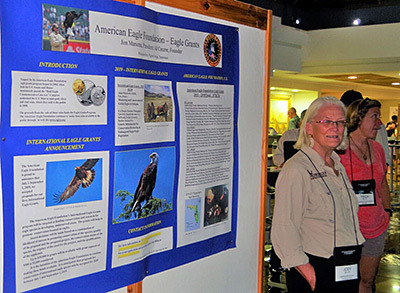 By the end of the summer, Andrea was confidently presenting information to tour groups and even debuted in the Wings of America show on American Eagle Day. Our 2018 intern, Andrea McCravy, became skilled at presentations and interacting with young visitors who were excited to learn about our birds. A primary role in the recovery of Bald Eagles can be attributed to extensive public awareness and environmental education. The American Eagle Foundation has educated millions of Americans through appearances and public outreach. In addition to making voluntary appearances with Challenger at schools and hospitals while we’re on the road to perform at sporting events or conventions, our staff frequently presents programs locally featuring our raptors at parks, schools, and other venues. We conducted 90 educational programs in 2018 and reached over 6,000 people. Besides Bald Eagles and Golden Eagles, we have a variety of beautiful educational ambassadors, including hawks, owls, falcons and vultures, along with a crow and a raven. A particularly fun experience was held June 21, 2018 at Honeysuckle Hills in Pigeon Forge, TN, where the AEF presented a Birds of Prey program for a county-wide (Sevier County) 4-H Photography Club. Our birds were the stars of the show, and the students not only learned about raptors, but also created a video of program highlights. A huge improvement was made to our Hack Tower in 2018, thanks to a successful Raise the Roof Campaign. Through many decades of providing temporary homes for eaglets or other raptors waiting to be released into the wild, our stalwart Hack Tower on Douglas Lake in East Tennessee has witnessed over 150 glorious first flights! However, aging and natural elements have taken a toll on this structure, requiring the need for significant repairs. During the Raise the Roof Campaign over the summer, $10,000 was raised to conduct the much-needed repairs. More facility improvements are in the works for 2019! AEF continues to participate in three annual charity events, with Bald Eagles Challenger and Mr. Lincoln. The Horatio Alger Awards has been an event Challenger & the AEF have participated in since 2004. This organization has awarded over $125 million to more than 25,000 young people in the United States and Canada. In addition to financial aid, students receive assistance with internships, mentoring, housing, support, and referral services. We were honored to participate in the 71st year of this worthy cause. Challenger has been invited back in 2019 for his 15th consecutive year attending this prestigious evening of events! For over 20 years, Celebrity Fight Night has raised millions of dollars benefitting the Barrow Neurological Foundation (the world’s largest neurological disease treatment and research institution), the Muhammad Ali Parkinson Center, and BNI’s Alzheimer’s and Cognitive Disorders Program. Considered to be Minnesota’s largest fundraising event, So The World May Hear gala honors the contributions of generous donors and supporters who helped Starkey Hearing Foundation provide thousands of free hearing aids to children and adults, as well as supporting and contributing to hearing health programs and initiatives nationwide and around the world. For many years, the American Eagle Foundation and Bald Eagle Mr. Lincoln have participated in this event, and did so again in 2018. AEF continues to receive the highest scoring from Charity Navigator, achieving a 4-star rating for the 6th consecutive year. Fewer than one percent of the thousands of charities rated by Charity Navigator have earned perfect scores, and we are one of them, earning a 100% in Financial, Accountability & Transparency. The AEF depends on people like you. We seek no state or federal funding and continue to rely on donations from concerned citizens and socially responsible corporations who share our common goal.